Using our reliable technology and high development ability, we have succeeded in creating automatic sewing machines that can handle pleats and full turn hemming, which are considered the most difficult tasks in curtain sewing that require experience and seasoned practice. By accurately grasping customer needs through our high technical ability, we are making ongoing efforts to develop new products and creating original remodeling of existing machines. ・This machines automatically and sequentially sews the cloth edge, achieving beautiful curtain pleats sewing finish made to measure. Automatic positioning is instantaneously completed through automatic calculations using inputted former width, width of finish, pleat number and the number of folds. The sewing pattern corresponding to the pleat height is automatically selected. Setting of depth in pleat is possible, with additional finish width adjustment function. Option: Super-soft pattern matching device / Adjuster hook device. Automatic pleats sewing machine for custom-made curtains with semi-automatic operation device. 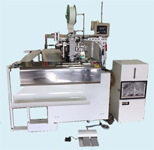 This machine allows completely automated operation, except the start and finish sets. It also allows full automation in finish width adjustment for the three final pleats. Thanks to the possibility to input work data for the next product ahead of time, as well as measuring former width during operation, the efficiency of machine operation is better improved. This is the automatic sewing machine for custom-made curtains that comes with full turn hemming function! 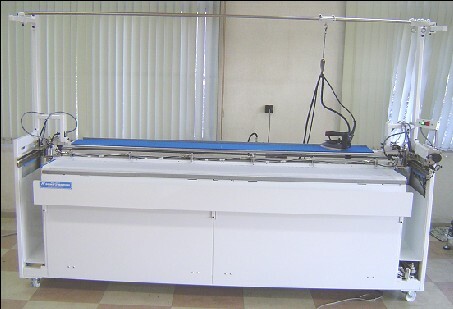 This machine employs the industry’s first ever epoch-making method to continuously tuck and fold fabrics and feed them into the sewing machine. Wide order-made full turn hemming (55-120mm) can also be automatically sewn to accuracy! 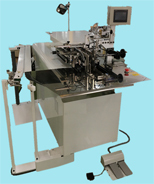 This machine creates beautifully uniform width finish using a newly developed tucking and feeding mechanism. Automatic sewing combining two processes! Tape is first sewn to cloth at the feed end of the machine. The cloth is continuously double-folded using an original mechanism we developed. The top folding stitches are done as the cloth exits the machine! "Tape attaching and top folding stitching" are important processes that can affect the pleat quality. This machine combines these two processes to achieve accurate automated sewing through simple operation! Panel joining is finished finely! It is automatic sewing only with setting cloth, even if inexperienced in sewing! There is neither difficult pattern matching nor pattern shear by sewing shear! Creates beautiful 2-fold or 3-fold on curtain hems, making the ironing process easy and smooth! This machine can accurately and swiftly iron out 2-fold or 3-fold shade curtain hems, a process that usually takes time and effort! The width of the fold can be changed between 15mm-85mm. The fold length is up to 2200mm per folding process. * Further length possible with repeated process. Curtain length determining machine, style curtain CAD, curtain transportation truck, cloth spreading and cutting machine for stripes and other patterns, curtain cutting machine, curtain inspection machine, and many others. We Are Looking For Sales Partner! Is there any customer who desires problem solving about rationalization and improved quality of order curtain sewing? By diversification and quality improvement of user needs, the market of on-demand order curtain is expanded increasingly. We are wishing our order curtain sewing machine which can be changed in size correctly and flexibly becomes what is useful all over the world. Copyright NAKANIHON-JUKI All rights reserved.